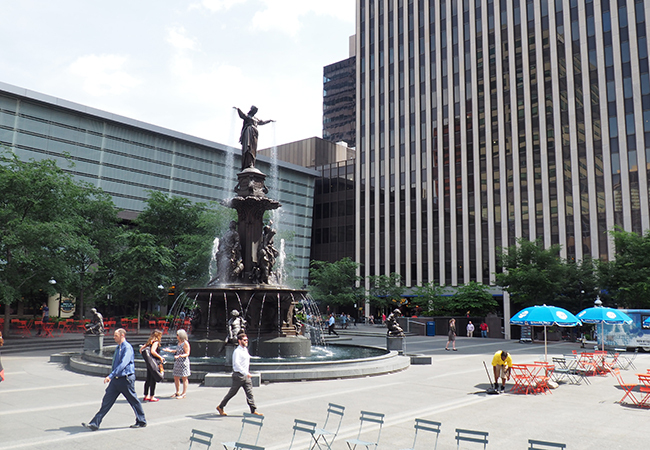 Fountain Square has a rich heritage as the center of Cincinnati’s civic, social, and commercial life. To this day, it serves as the epicenter of downtown, and City's main gathering space. When the Tyler Davidson Fountain was dedicated in 1871, Fountain Square was simply a wide esplanade down the middle of Fifth Street. In 1970, the Square was redesigned for better traffic flow, and the fountain was moved to the south end of the plaza. In 2000, the fountain was cleaned, restored and rededicated. 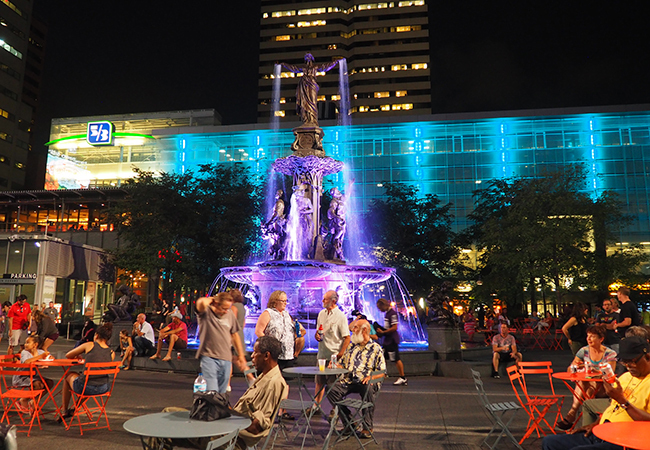 In 2006, as one of three key projects to revitalize the center city, Fountain Square was renovated to reclaim its place as the heart of Cincinnati’s public life and to become a catalyst for downtown rebirth. Cincinnati businessman Henry Probasco dedicated our famous fountain “To the People of Cincinnati” in memory of his business partner and brother-in-law, Tyler Davidson, on October 6, 1871. Designed to rival the great fountains of Europe, the bronze and granite fountain glorifies the blessings of water. Streams of water flow from the outstretched hands of the nine-foot-tall Genius of Water, affectionately known as “The Lady.” Below her, large human figures represent water’s practical uses, and on the base, four child figures represent the pleasures of water. The four figures around the rim were originally designed as drinking fountains, and visitors can still drink from them. The water that flows from these figures is fresh, not chlorinated, water. In the Square’s current design, the Fountain has been given a prominent, central position overlooking the Square, adjacent to ample space for seating and areas for major events. The fountain is turned on the Saturday before Major League Baseball’s Opening Day, and remains on until temperatures consistently dip below freezing, typically in late November or early December. During that time, the fountain usually runs 24/7, but it may be turned off between 3 and 6 a.m. when the Square is closed.